Sunday after church, Dave called and asked me to bring the Firefly over to his place that evening, sounded like a great idea. Took off at 5:30, beautiful day, light bumps, Firefly was flying great. Then the engine quit - at the worst possible place, and Big Dummy Pike was flying too low to make it to anywhere other than a giant blackberry patch on the side of a hill. Only got one picture of the aftermath, the guy in the picture lived just over the hill and came to help. Got it loaded on the trailer and home by 9:15 that night. Piston was seized in two places, I am thinking that using a Free Air 277 in the pusher configuration is a bad idea. Since I have to taxi uphill before takeoff, it probably gets the engine too hot and then you have to heat it up even more when you takeoff. Or something like that. The plug looks good, the EGT was staying between 1050 & 1100, fuel was fresh & had the right amount/kind of oil, so - who knows? Bent the gear a little, we straightened them today. 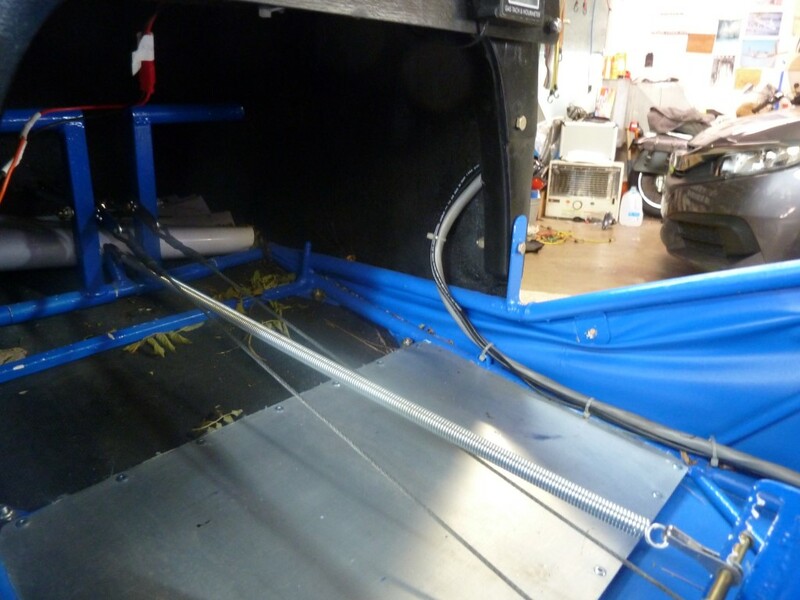 Bent the fuselage forward tubes a little, will cut off some fabric and straighten them tomorrow. Then will need to patch a few cracks in the nose fairing. Oh well, it actually turned out pretty good, I always ask the Lord to protect me prior to each flight, and if I had not had my left hand still wrapped around the throttle lever (like that was going to do any good!) I wouldn't have even got a scratch. Instead, the back side of my left hand found the blackberry bushes immediately upon arrival... ate me up! What was really funny, I had a Dr. appointment Monday morning with my regular family Dr. that I have had for 25 years, he came in, took one look at my left hand, and said "What have you done now?" 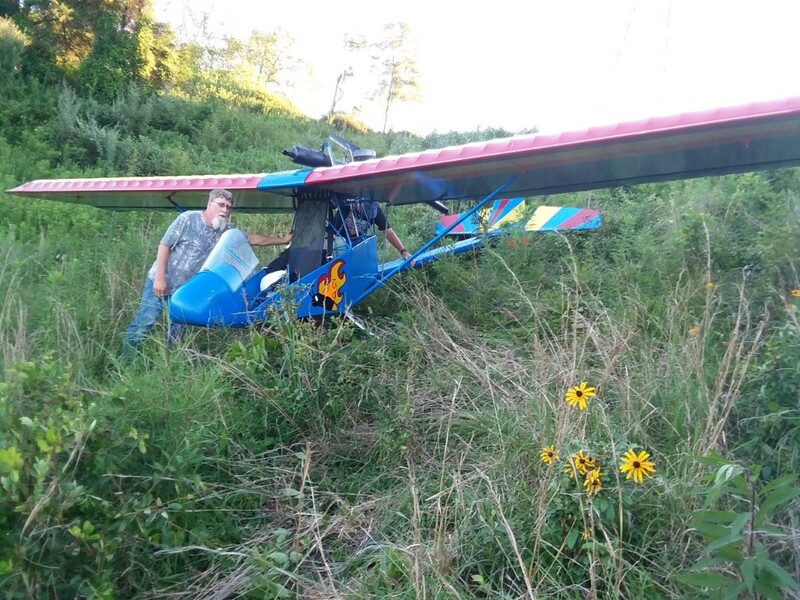 Me: "I landed the ultralight airplane in a blackberry patch." Hey Richard, I’m just happy that you’re ok. Airplanes can always be repaired or replaced. I’m glad you walked away. Free-air may work fine on tractor drives, but questionable on pushers. I seized a brand new 377 many years ago. Fortunately I was at 2000ft AGL right after takeoff and easily glided at to the airpark. Psalms 19:1George H.
ultralight instruments are not precision instruments and not instantaneous. second when that slight film of oil breaks and the seizure takes place. Fuel cools and oil lubricates. I have also heard free air two strokes don't cool well on pushers. Titus, Alabama - Remembering the interesting days of two strokes and Kolbs. Thanks John, I could not remember so I went down and looked at it, it seized on both the intake and exhaust side, but I noticed something just now that did not register earlier: (a lot of things did not register earlier - I got overheated working on it today and the brain was in slow motion) there is a vertical gouge on the cylinder on the intake side caused by the top rings at the point where they meet. I will pull them off tomorrow and check for end gap. The engine came with an invoice showing a fresh overhaul from Lockwood several years ago, and had (supposedly) never been run. I guess I should have pulled the top end off and checked it, but did not. It is still a little early for much carbon or soot, only got about 12 hours on it. 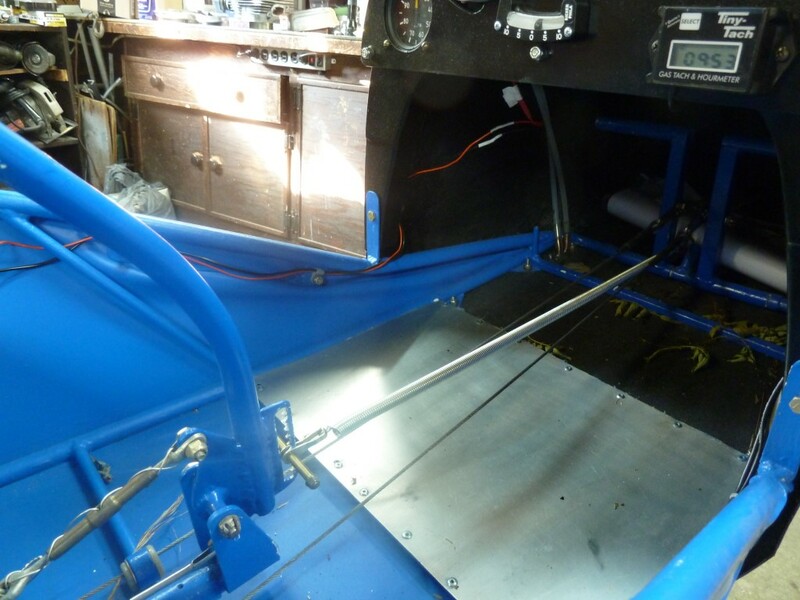 And Phillips Injex (which I prefer to Pennzoil) is not near as sooty and dirty as Pennzoil. It is jetted almost exactly as the factory calls for, the needle is 1 slot richer than spec. We are in complete agreement on setting up an engine; jet to factory specs, set the prop to just nudge red line in level flight at full throttle, and use the egt to monitor things. the gap was not in line with the intake or exhaust port. little carbon on the piston. a ring or might even cause a break down in that micro coating of oil. Glad your or the plane are fine. Thanks for sharing. 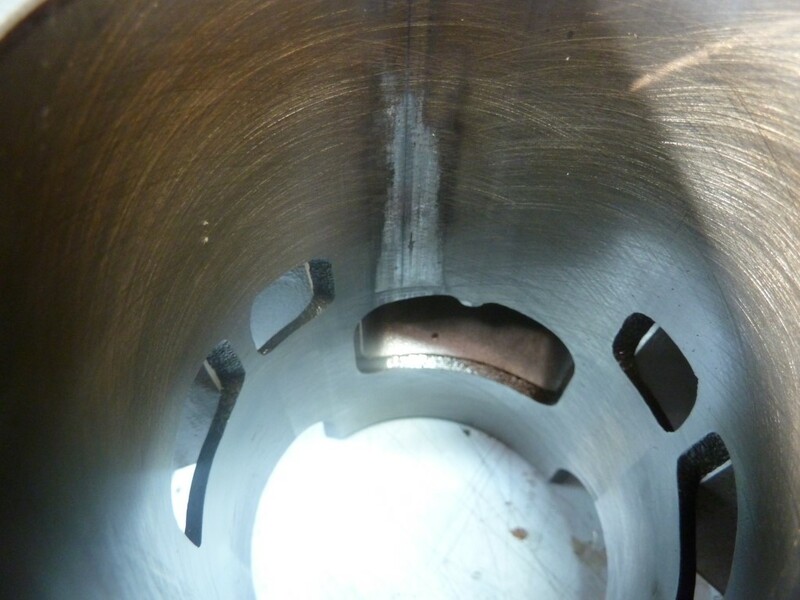 The top edge of the intake port was not chamfered after the rebore, it is sharp enough to shave with, and that is apparently where the seizure started. The seizure is at the point where the ring locator pins are situated, and although it does not really show in the picture, there is a hint of silver along that edge, apparently that is a minute amount of aluminum that was shaved from off the seized area. 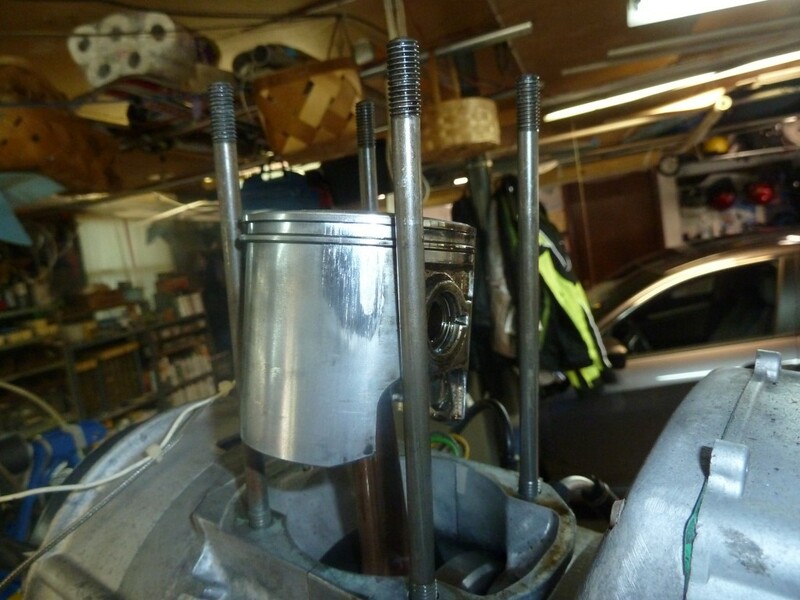 Once the seizure began, the piston then apparently begin to seize on the opposite (exhaust) side due to the increased pressure on the intake side of the piston from lack of clearance. The bottom side of the intake port was chamfered, as are both the top and bottom of the exhaust port. None of the transfer ports were chamfered, all of them are extremely sharp. And that might be OK, they are small and not near any ring ends. Need to do some more research on that one. the ports. Might save a lot of grief. Let us know what you turn up in your research. when landing gear entered into the tangles of stems. the plane I loved to fly that I almost couldn't look at the wreckage. surface tension and thought I had faith where it didn't belong. overbearing at times. But it appears Frank may have been correct. advocate and thinks of Einstein as a government shill. I tend to agree. now. I recently bought a cabin in Wears Valley, just a tad SW of you. that's how I came up with the name. Be safe everyone, and I hope to see some of you in the sky soon. Your goal is to enable the ring to ease into the gap caused by the port and then ease back out as gently and as smoothly as possible. So you work your chamfering to include all the sides, top and the bottom of the port. Picture in your mind where the ring is going to want to push out, and then be put back in, and bevel as necessary. Apparently a little bit goes a long way. A light touch with a fine stone or diamond bit is plenty, followed by a careful application of a strip of emery cloth through the port and into the cylinder w/o touching the cylinder walls, with frequent rinsing with kerosene or mineral spirits to keep it all really clean. Use the emery cloth to take off any sharp edges or undesirable metal that the stone/diamond burr leaves. The goal is not to make the port any bigger because that changes the valve timing, but just to ease the rings expanding into the port and back out without any stress or damage. Apparently this is true whether you are working with the larger intake and exhaust ports, or the smaller transfer ports. 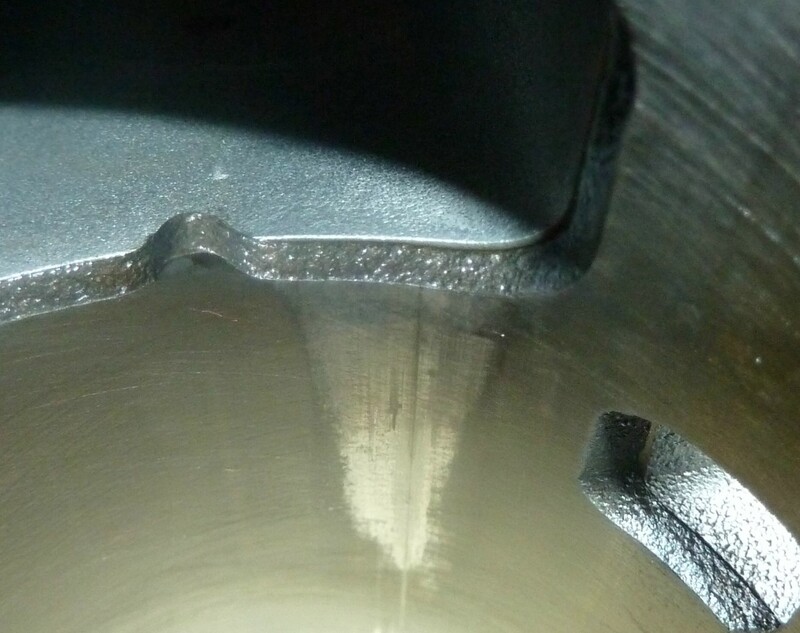 A carbide burr in a die grinder does a quick and easy job.